Adam Stout works in the technology field and is currently located in San Diego, CA. I was flipping through some news the other day and read a story about how a BestBuy employee was expecting to be fired after releasing a video which in didn't mention BestBuy, didn't he was an employee of BestBuy, and didn't even mention his name. For this, I figured I should at least watch the video since he gave up his job for it. This classic tale tells the story of an typical Apple customer asking for an iPhone and can't tell you why or listen to any evidence that the iPhone isn't the greatest thing ever. Well worth the three minutes to watch it. On a related note, if you don't watch Futurama, you should. The last episode, "Attack of the Killer App" was awesome. They really got the essence of the nonsensical hype that is apple. This isn't the best part, but I love the observations that since it is Twitter and not Tweeter, a message isn't a tweet, it is a twit, right? What Can't You Get at Costco? Apparently while I was at work today, Jenny got a call at home from Costco. They were conducting a survey to see whether or not we would be interested in buying health insurance from them. While I do like Costco and I think they sell many quality products, I'm not sure I want to buy my health insurance and toilet paper from the same place. I can't help but think about Mike Judge film, Idiocracy. In the movie (seen on the left), Costco sells everything. The main character's lawyer even got his law degree there. Regardless, it is Costco, and I trust them so once they start offering insurance in Virginia, I'm sure I'll at least get a quote from them. Welcome to Costco... I love you. A couple of months ago I downloaded the public beta of Office 2010. Overall it seemed fine although it was difficult to see what was really changed. Most of the apps looked essentially the same as in Office 2007 except I did notice that Groove was renamed to SharePoint Workspace. It seems to work the same (with some small enhancements) but overall, it looks the same to me. The one exception to this was Outlook 2010. It didn't sync correctly with my BlackBerry so I couldn't use it for long and had to revert to Outlook 2007, but the one feature I really liked was the Social Network integration. This is similar to how smart phones sync with Facebook (and how Linked In should) so the profile picture and phone numbers stay in sync with what your contact has listed on the site. This is a great feature to help ensure you don't have stale email address or phone numbers which both seem to change a little too often now a days. In Outlook 2010, Microsoft allows 3rd party developers to create connections between Outlook and what ever internet service they want to help sync the information. They released this feature as a free add-on to older versions of Outlook. 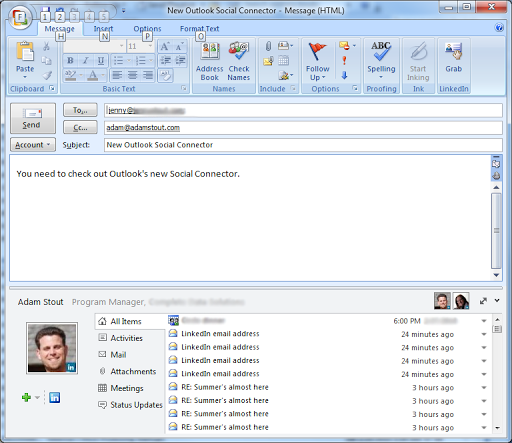 You can download the beta version of Outlook Social Connector which works with Outlook 2003 and 2007 (and of course this is built into Outlook 2010). Once you have the Social Connector installed, you can get the connector for LinkedIn from their site for free as well. You can expect that a connector for Facebook will be forthcoming after the release of Office 2010 (or perhaps even earlier), but for now, I'm happy with LinkedIn since those are the contacts I'm not concerned with anyway. If you have traveled through any airports lately you may have noticed that several airports have free WiFi (through January 15th) thanks to Google (via what appears to be a partnership with Boingo). It is interesting to me that included on the list of airports Google is providing WiFi for is San Diego and Pittsburgh both of which already had free WiFi. I've only traveled through a few of the airports on the list where I've tried to use the internet, and although I know Dulles (Washington, D.C.) and Austin do not normally have free WiFi, my sampling shows 50% of the airports already had free WiFi. It is also interesting that while Google is getting a lot of press for this "benevolent" action, there are others (like E-Bay) that are sponsoring free internet in other places but not getting much press. While at first this looks like a normal Terms of Service agreement that you have to click on to get onto a public network, it really is a way to grab some more market share for Chrome. While people are just trying to get on-line in a hurry, they are going to download Chrome because they think they need it to continue onto the internet. I almost clicked on it and I'm a pretty technical person, I would love to see how many people Google tricked into downloading Chrome and having it automatically become the default browser. 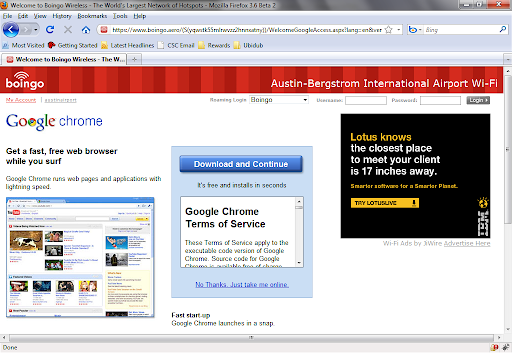 If GMail didn't make Google Evil, Chrome certainly did. On a side note, while trying to find the list of airports that Google is providing the WiFi for, I searched for "google free internet" and came across Google's free at home internet, TiSP. If you search either Google or Bing you'll see this comes up first. So while Google is Evil, at least they have a sense of humor. Why do I have a FastBreak account? 1) I have for the last 10 weeks or so using my Fast Break and although Avis has a sign up where people can see what car they have and can go straight there, I have to go to the booth, wait in line and find out what car I have. This is amazing since i have to go to the Avis booth to get my car. 2) Last week I rented a car (with FastBreak) and it was a horrible experience. Once I waited in line to find out what car I had, I went to the space (lugging my baggage) and there was no contract in it. Then I went back to the booth and although I just asked for them to print a new contract, someone went to look then looked at ALL the cars to find my contract. After about 20 minutes they came back and printed a new contract (for a different car). What a waste of time. 3) When I returned the car, I looked at the contract and the bill was twice what it is normally (each of the past ten weeks or so). It took about 20 minutes after I returned my car to get it straightened out. Once again, I'm glad I had the FastBreak to help me out. 4) I rented a car tonight and after waiting in line to get the contract (and waiting for about 10 minutes while they looked it up and printed it) and going to my car, I looked at the contract and found yet another rate on it (not as high as last week, but still way too much). I went back to the booth and after about another 10 minutes, I got the correct rate. Good thing I had Fast Break. Please explain to me what FastBreak gets me and why I should ever rent from Budget again? This seems to become more and more of a problem and take more and more of my time. Since I fly in at 10pm or so on Sunday nights, I would really hope to save any time I can getting to my hotel. This concept seems to be missed by your company. 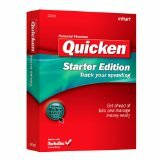 For the past week I've had a problem updating one of my account in Quicken. This happens occasionaly, but overall, I'm pretty happy with Quicken (I just started using it in June). However, when I tired to use their on-line chat support, I had a horrible experience. Below is the message I sent to Intuit. I couldn't find a place to send them feedback on the support process itself so I had to pick another category. Hopefully somewhere there find this message and does something to improve the quality of their support. "I tried to use your on-line chat support and it was a horrible experience. 1) They didn't seem to tell me what was going on. No "just a second while I look up the problem" just an "ok" and then a long period of nothing. I had to keep asking what was going on. 2) I couldn't tell if the person was restating my question or telling me what to do. It would be helpful if they said, let me clarify... or lets go through these steps to see if we can solve the problem. 3) It would be faster if you just supplied the script they are reading from. They wanted me to do something and when I asked what we are trying to accomplish, all I got was "please follow the steps"
I hope you can track down the log for my session and change something. I would have been better off not event starting the chat that was not helpful and wasted my time." 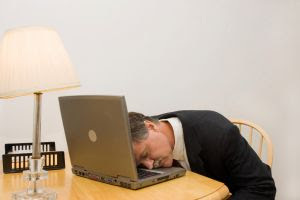 I came across an interesting (and short) article entitled "6 tips for lazy workers to get ahead". This really resonated with me. I believe in working smarter, not harder. In this vein, it is important to take a break and not work all the time. Distractions are important. The most important note for me is the affirmation not to multi-task. The human brain simply can't do it. You can switch tasks quickly, but you can't do two things at the same time. This page took 0.367 seconds to load.